It was no surprise when Carl Piergianni was named Boston United’s Player of the Year at the end of the last campaign, and it was a given that his face yet again adorned the National League North’s ‘Team of the Year’. A tough, talented and combative force at the heart of ‘The Pilgrims’ defence, Piergianni is as articulate, measured and likeable off the pitch as he is solid and skilful on it. We discuss everything from Carl’s early memories as a Peterborough United fan, to learning the ropes in the Northern Premier League with Spalding United, a brief appearance for the first-team of his boyhood heroes, the experience of relegation at Corby Town…and much more. With Boston pushing for promotion again this season, there’s no better time to hear from one of the division’s hottest prospects. DB: You’re a Peterborough lad, and spent your youth career with the POSH. What are your memories of supporting the POSH growing up, and what do you remember about being a young player at the club? CP: I have really good memories of supporting the club as a youngster. One of the first games I remember going to was when Peterborough played Darlington at Wembley in the playoff final [in 2000]. They won 1-0 and Andy Clarke scored the winner and that was one of many great memories of being a Peterborough fan growing up. Being a youth team player at Peterborough United was great as well. To be named Captain during that time was a great honour and then to get offered a pro contract – at my hometown club – was fantastic. It was exactly what I’d always dreamt of. 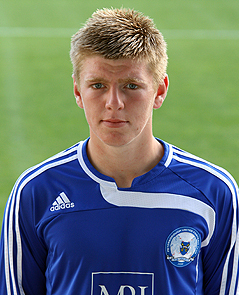 A youthful Carl during his Peterborough days. DB: Despite coming through the ranks at London Road, your first taste of senior football came 20 miles north at Lincolnshire club Spalding United. Were you keen on heading out on loan to play mens football? And was it tough to adapt to the physicality of the Northern Premier League, as a young player? CP: I was very keen to go out on loan, personally. The advice I’d give to any young player now is that it’s vital to go out and get experience of playing in mens football, as early as possible. Doing so made me the player I am today. I became a lot stronger, a lot more physical – so I definitely recommend going out and playing first-team games, rather than sitting on the bench or player under-21 matches. I enjoyed the toughness of the NPL. I’m quite a physical player and don’t mind getting stuck in. It was important to learn how to use my body in those kinds of games, and also to adapt to a game which actually meant something. When you play in reserve games, obviously you want to win, but it doesn’t really mean anything. However, when you go into a club like Spalding and it’s a proper first-team game, the 3 points are vital and the team were trying to survive relegation [from the NPL Division One South]. You quickly learnt that both performances and results really meant something. DB: In 2010 you had your first taste of the Football League back at Peterborough, but it was just a single game. What are your memories of that sub appearance against Rochdale? And do you feel you deserved more first-team opportunities at London Road? CP: At the time, I don’t think I was ready to be starting games for Peterborough. I wasn’t quite good enough at the time, and I was only a young lad – so I don’t hold a grudge against anybody at the club. There were much better players there than I was at that point. Peterborough were challenging to try and get up into the Championship, so it was difficult for me to get a game. With a debut, people always say ‘it’ll happen when you least expect it’. And I remember just being sat on the bench, and [then manager] Gary Johnson suddenly just told me I was going on. So I was suddenly just standing on the sideline, my knees shaking, and just waiting to go on! DB: You joined Altrincham on loan later that season, in early 2011. The club’s awful start to that season meant they ended up relegated from the Conference Premier, but you were a regular fixture in the side, as results improved. So was Alty an experience you enjoyed or not? CP: Very much so. Altrincham’s a great club. As you said, they had such a bad start to the year that it was hard for them to claw their way back up the table. There was a big gap of points between them and safety at one point, but during the time I was there Alty won a fair percentage of the games we were involved in, so it was actually a period I really enjoyed. Credit to Altrincham, they’re back in the National League now and as with Spalding, I felt it was a club which did a lot to help develop my career. The players there were a very close, tight-knit group. Robbie Williams at the back, Sean Densmore (who’s now Alty captain) at full-back, and Damien Reeves – they were really good players, and everyone there ensured I loved my time at Altrincham. There were no cliques in the changing room, which was great – everyone at the club just got along really well. 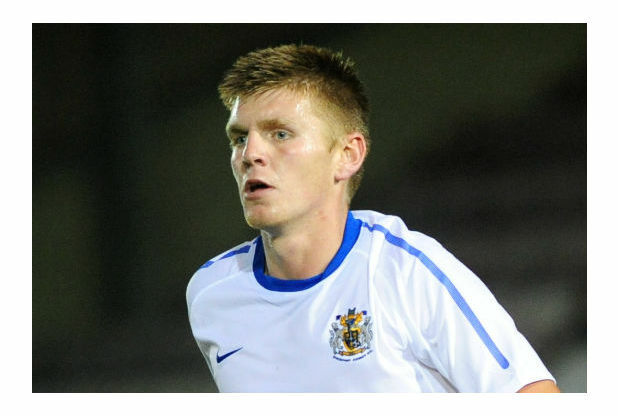 DB: Aged 19, you moved to my local club – Stockport County! You played in almost every game that season, as the club stabilized themselves in the Conference Premier. But you had three different gaffers in that one season – Dietmar Hamann, Willie McStay and Jim Gannon. How did they all compare? CP: That was an interesting experience. Dietmar Hamann and Jim Gannon were polar opposites. Willie was the assistant under Didi Hamann, so he was familiar to us already, and his management style was similar to Didi’s. Didi had a more relaxed approach than Jim Gannon did. He’d change the team a lot, go with different tactical approaches and was very keen on rotating the squad. He was a lot more laid-back in training and gave the players free-reign to play as they wanted to. Jim was at the opposite end of the spectrum. He knew exactly what tactics he wanted to employ in every part of the game, and stuck to a certain way of playing. So, two deeply contrasting managers! Carl in action during his season at Edgeley Park. DB: At County, you scored your first league goals in senior football, getting four in total. What do you remember about your first two, both scored in an exciting 3-3 home draw against Hayes and Yeading United. CP: I just had a bit of luck and managed to score two! (*Laughs*). The first one just came to my feet and I slotted it in. As for the second, I just remember being completely surprised after scoring again! Sadly I didn’t have a celebration planned, I think I just raised a finger into the air and ran off. DB: You moved to Corby Town in October 2012 after just over 12 months at Stockport. You helped the side to some excellent results in that early period, and scored 4 goals in your first 5 games! Why do you think you fit into that side so well? And what caused your sudden goal rush? CP: I always thought I was a threat from set-pieces, and having moved down a league, where the defensive marking wasn’t always as good, I found it a bit easier to get goals than I did in the Conference Prem. I also had the benefit of a giant centre-half next to me in Paul Malone, so their biggest player would always be marking him and it’d give me a chance to go up against someone a bit smaller! I managed to get on the end of balls quite a lot, and luckily a few of them went in. DB: Corby were extremely unlucky to be relegated that season, going down on Goal Difference – and just by a solitary goal – below Histon. As a player, how do you cope with that kind of a setback? And did the club’s drop to the Southern Premier League influence your decision to leave? CP: That was a really tough time for me personally, and for everyone at Corby Town. I’d really enjoyed being at Stockport, and I was sad to have to leave the club. I chose Corby because I’d moved back home and wanted a local club, to try and steady myself again. That season, I thought all along that Corby would comfortably avoid the drop. We had an okay squad, and I certainly thought we were good enough to compete in the division. We played some good football at times and looked like we were going to avoid the drop, but unluckily went down by such fine margins. All we needed was a point in any of the games that we lost, which was tough to take. Once the club went down, I made the decision that I wanted to play in the Conference North (or higher) in the following season. 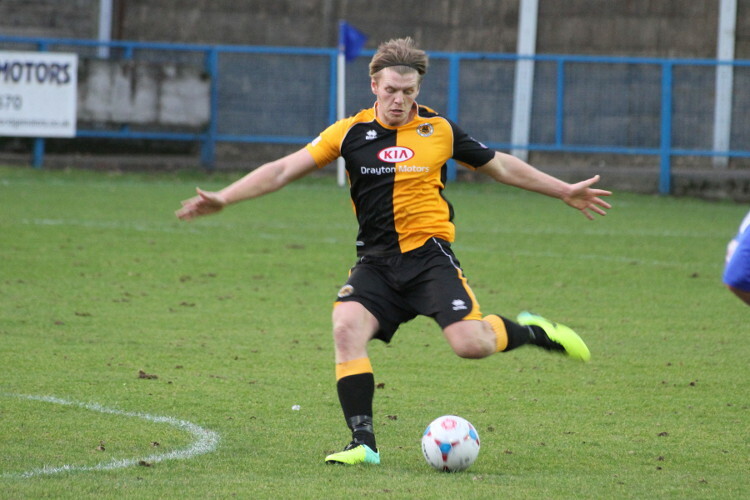 As soon as I spoke to the people at Boston United, I knew that joining them was the right move for my career. DB: In May 2013, you headed to York Street, home of your current club, Boston United. In that first season, the club finished 6th in the Conference North, and you were part of a formidable defensive unit, alongside the likes of Scott Garner, Conor Marshall and Netan Sansara. What were those guys like to play alongside? CP: It was interesting, because when I signed for Boston I was the only centre-half at the time, and then the gaffer told me he was bringing in Scott, who’d been captain at Cambridge United the year before. Playing alongside Garns* [*Scott Garner] was great, and he’s challenged me and brought my game on a hell of a lot. I’ve really enjoyed playing alongside him, and the other lads you’ve mentioned. DB: Going back to the beginning of that season, your competitive debut for The Pilgrims was in a 4-1 win away at Edgeley Park, home of your former employers Stockport County. Is it extra sweet to beat one of your old clubs, or is it no different to any other 3 points? CP: There’s always something extra there when you play an old club. You want to try and show that club what they’re missing! The main thing is always getting the win, but personally it was really special to do that at Edgeley Park. DB: Last season Boston improved on that 6th placed finish, ending the season in 3rd place – before the narrowest of play-off losses to Chorley. The Pilgrims have been a little inconsistent so far this season, but do you feel this squad has the quality for another play-off finish…or maybe more? CP: Definitely. I think we’ll achieve at least a play-off spot this year. We’ve been a bit hit and miss at times, but the quality across this group of players is good enough to be up there. It’s about getting a sustained run of form. We’d gone five games unbeaten – with four wins in there – before the North Ferriby game [a 4-3 loss on 7th November]. But when you have those frustrating results, you need to bounce back. That’s absolutely vital if we want to finish in the play-offs. Boston’s defensive dynamo in action against Stalybridge Celtic. DB: Absolutely. And alongside yourself, who would you say are the main danger men for Boston. Who should we all be watching out for? CP: In terms of goals, you can’t look past Dayle Southwell. He’s already on 12 for the season. But he’s only one of the really good strikers here. Mark Jones is so hardworking up top, and he’s something of an unsung hero for us. We’re certainly not short of options in attack. From set-pieces, me and Scott Garner chip in with quite a few goals, so I think as a side, we always pose a threat – whoever we’re up against! DB: You’ve made it into the Conference North/National League North ‘Team of the Year’ two years running, and at 23, you still have a long career ahead of you. Are you looking to stay with Boston in the long-term, or is the aim to keep performing well and hopefully interest a Football League side. CP: I always hope that one day a Football League side will be interested in me. But Boston have treated me so well, and I’ve always had good dealings with everyone at the club. I couldn’t ever envisage leaving for another club at this level. For me to even consider moving, the interest would have to be from a club at the top end of the National League [Premier], at the very least. Living here is important for me, as well. I’m close to home, I have work outside of the game and there’s football at a club I really enjoy being a part of. When it comes to Football League interest, though, I don’t think anyone [at this level] would be able to turn it down. DB: We’ve talked about the National League North. It’s a division with some lovely old grounds and some pretty impressive new stadiums. Is there an away trip you especially enjoy – either for the results you get there, the location or what kind of away support the Pilgrims fans bring? CP: Stockport’s probably the best away ground I’ve played at. When we played at Edgeley Park on the opening day of this season [a 2-1 defeat for Boston] the atmosphere was electric, and as a player, it’s great to be involved on the field when the ground is like that. Tamworth is another trip I always enjoy. We always get an excellent away following there, and [The Lamb Ground] is a really tight ground, the fans are right alongside the pitch, and it’s a fixture where that traveling support always makes a lot of noise! DB: I know from Twitter that you like a bit of Ibiza. So what else do you enjoy away from football, aside from soaking up the sun? And what job you do outside of playing the beautiful game? CP: I like to travel. And not just to Ibiza! I’ve been around Asia and traveling is always something I’m looking to do come the end of the season. I try and save my money so I can see as much of the world as possible. I always like pre-season but we stay here, which isn’t quite as exotic! Outside of football, I work for Molson-Coors, the Brewery, as a sales rep. I go into convenience stores and Co-Ops as an account manager for them. And it keeps the money in that I need, as someone playing football part time. Aside from all that, I like the gym – though that’s also a necessity when you’re playing football – and like everyone, I enjoy a bit of golf in the summer! Thanks to Carl, and best of luck to him and everyone at Boston United for the rest of the season. You can find the Pilgrims defensive rock on Twitter @CarlPidge. With a programme curtailed by the FA Cup, there were just five games played in the Conference North. These games did entertain though, with fourteen goals shared between the clubs, and no goalless draws. Leaders Stalybridge maintained their three point lead at the top of the division with a 2-0 win over Worcester City at Bower Fold. The visitors themselves are currently chasing a playoff place, but two goals from striker Connor Jennings sealed the points for the home side. The young striker now has thirteen goals in the league this season. Second placed side Hyde also won, with a convincing win at Harrogate Town. The result was made all the more striking as all three goals came from defenders. Andrew Pearson, Danny Hall and Gianluca Havern netted the goals that keep up the pressure on the leaders. Boston United missed the chance to rise into the playoff places as they could only manage a 2-2 draw with Colwyn Bay. Jason Lee put the hosts in front, but it was the visitors who went in ahead at halftime. Two goals from Lee McEvilly in stoppage time at the end of the first period turned the score on it’s head. In fact, it wasn’t until the eighth minute of added time at the end of the game before a thunderous thirty yard effort from Ben Milnes meant the spoils were shared. In the other two games, Histon recorded a much needed win, beating Workington 2-0 thanks to second half goals from Daniel Sparkes and Dan Holman. The result saw Workington drop to second bottom, as Eastwood Town got themselves a fine 2-1 atVauxhall Motors thanks to goals from Jake Sheridan and Jarrod Westcarr. The home side had led through a McGivern penalty, but that lead lasted just two minutes. There is another game on Halloween night, as Hinckley United host Solihull Moors. Both sides find themselves in a scary position in the league, and will be hoping to find the ghouls, sorry goals, to climb the table.